To succeed, local human rights groups must have some level of local support. Local groups can always call on foreigners for help, but lasting change requires domestic buy-in from politicians, state agents and ordinary people. Politicians need to feel the human rights heat from constituents, officials need to believe that human rights groups are credible, and members of the public need to contribute their voice, money and energies. Human rights activists are often pessimistic about the public’s views, believing their co-citizens view them with skepticism, or worse. According to our surveys in four world regions, however, the public views human rights ideas and organizations positively. Critical claims that human rights workers are linked to foreign powers and intervention, moreover, receive scant public support. Our data suggest that rights activists can feel cautiously optimistic about their public reputations. To learn how activists see themselves, we first interviewed hundreds of human rights experts, activists and workers across 60 countries, asking them to comment on how the public viewed them, their organizations, and their issues. Some believed their compatriots viewed them positively, as courageous campaigners for justice. Most, however, felt embattled, disliked, or disregarded. To test the activists’ perceptions against actual public attitudes, we inserted our questions into an ongoing public survey, Mexico, Americas, and the World, run by CIDE, a leading Mexican research institute. Their team administered our questions to a nationally representative sample of adults in Mexico (N=2,400) in 2012. Based on that experience, we developed our Human Rights Perceptions Poll, a unique battery of questions about public attitudes towards human rights issues, activists, and organizations. We deployed the poll in Morocco and India in 2012 and in Nigeria in 2014. We surveyed representative samples of urban and rural populations in and around Rabat and Casablanca (N=1,100); India’s major financial capital, Mumbai (N=1,680); and Nigeria’s largest city, Lagos (N=1,000). We over-sampled rural populations and ethnic or religious minorities to gather sufficient data from marginalized perspectives. We weight our results to account for this over-sampling. We worked with local companies in each country to administer the surveys, including Data OPM in Mexico, LMS-CSA in Casablanca, Team C-Voter in Delhi, and Practical Sampling International in Lagos. We chose these countries for a variety of reasons. They differ dramatically on factors such as history, colonial background, religious tradition, language, and region. Given this variation, any cross-country similarities powerfully suggest broader global trends. Yet the four cases also meet conditions that make studying rights meaningful and safe. They all have substantial, rights-inclined civil societies, and all have sufficient political freedom for members of the public to express political views and for pollsters to ask about human rights. Finally, all have pressing human rights problems attracting both domestic and international attention and mobilization efforts. Our findings leave us cautiously optimistic about the human rights movement’s prospects, even in this era of increasing government hostility towards civil society. We have published several articles from the data (see here, here and here), and are working on a book. Cumulatively, our findings leave us cautiously optimistic about the human rights movement’s prospects, even in this era of increasing government hostility towards civil society. 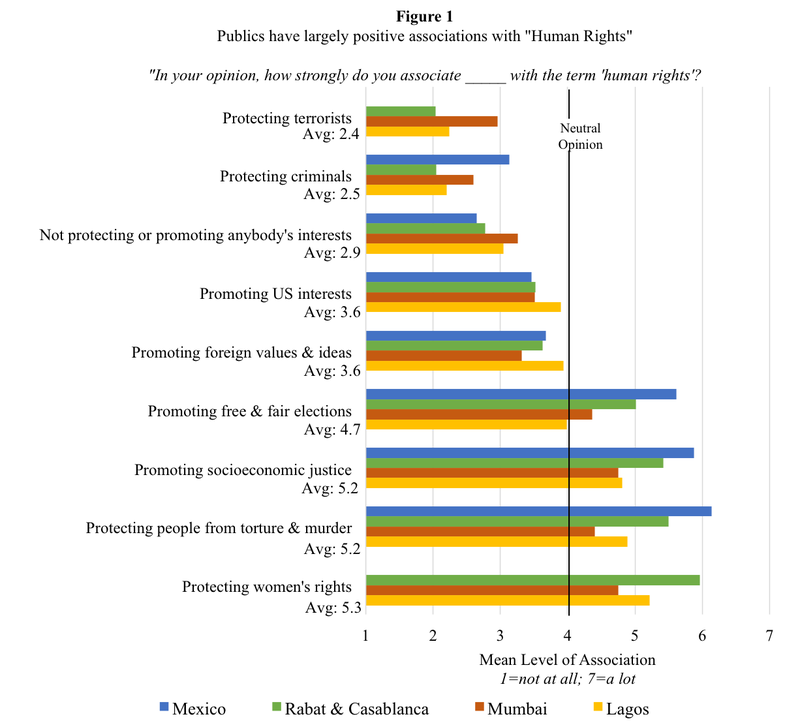 In all countries but Mexico, we also asked whether respondents associated “human rights” with “protecting women’s rights”, a particularly hot-button issue for rights activists worldwide. We asked each respondent to rank the strength of their association from 1, the weakest score, to 7, the strongest. A score of 4, the midpoint, indicates respondent neutrality; scores below that indicate little or no association, while scores above that indicate an increasingly strong association. We found some remarkably consistent results. Across all four cases, respondents were far more likely to associate human rights with positive sounding than negative-sounding phrases. Ordinary people, in other words, feel more warmth than chill towards the term, “human rights”. Associations of human rights with foreign intervention, moreover, received little support. Weighting each country’s scores equally, the average four-country association between human rights and “promoting U.S. interests” or “promoting foreign values and ideas” was a weak 3.6, below the neutral midpoint. Remarkably, publics also strongly associate “human rights” with “protecting women’s rights”, suggesting the women’s movement is tightly linked in the public mind with its human rights counterpart. Figure 2 offers other promising news. We asked the 6,000+ respondents about their trust in all manner of international and domestic institutions, which we express on a range from 0 to 1, or “no trust” to “a lot of trust”. Once again, we calculate an average score for each institution to which each country contributes equally. 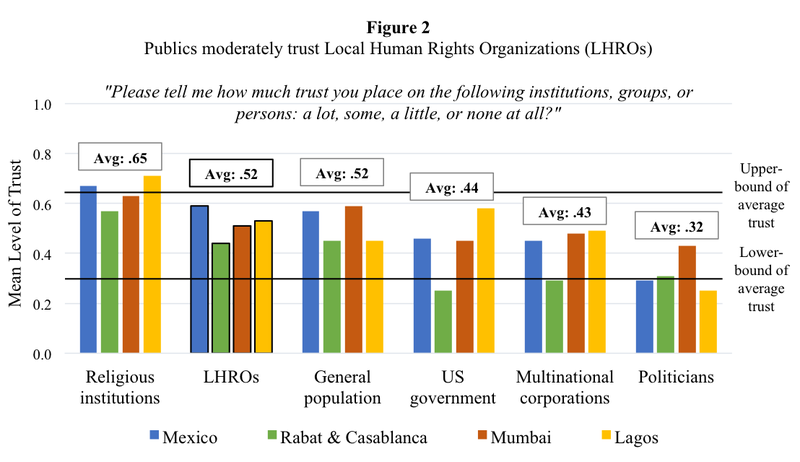 In all four countries, local rights groups scored towards the top of the public’s institutional trust spectrum. Across all cases, publics express high trust in religious institutions, whose four-country average is 0.65 on the 0 (least trust) to 1 (most trust) scale. Politicians, by contrast, were among the public’s least trusted actors, with an abysmal four-country average of 0.32. Local rights groups’ average of 0.52 places them in the upper end of this 0.32 to 0.65 range. Taken together, Figures 1 and 2 suggest that across diverse world regions, publics view human rights and local human rights organizations with favor. When we combine those who highly trust LHROs with those who most strongly associate human rights with “promoting socio economic justice” and “protecting people from torture and murder,” we find that 23% of the public, on average, are hard-core human rights supporters. Our polls may be overly optimistic, but the odds of over 6,000 randomly selected respondents responding in remarkably consistent ways across very different countries seem low. Instead, our polls likely reveal an underlying global trend obscured in polarized, elite-level debates: ordinary people do generally support human rights ideas and groups, even though both are often widely criticized in the media. Human rights professionals work in highly contentious settings, where critics often allege that human rights ideas and NGOs are motivated by ill intentions or the agendas of foreign powers. Ordinary people, however, seem less inclined to believe the worst of rights-based actors. More work is required to test and extend our findings, but our research suggests that human rights promoters have reason for optimism.